Bitcoin is trading under $4,450, but according to investor Dennis Gartman he’s not buying into the digital currency. According to the editor and publisher of The Gartman Letter, he doesn’t understand bitcoin. 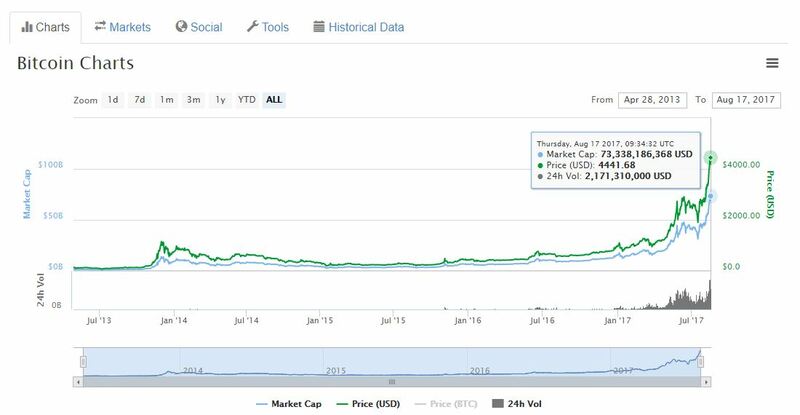 As of the 17th August, bitcoin is trading at $4,439, pushing its market cap to $73.3 billion. In the past 24 hours its value has risen by seven percent. Over the last seven days it has increased by 31.24 percent, according to CoinMarketCap. 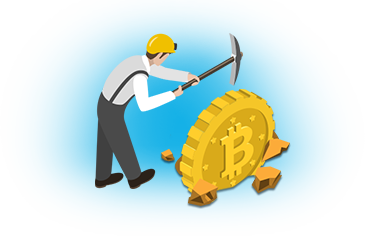 Despite bitcoin’s dominance, Gartman remains weary. So much so, that the currency’s price fluctuation isn’t convincing him to invest. The highest figure it has reached was when it was within touching distance of $5,000 at $4,482. Shortly after it dropped to just above $4,000. Since the beginning of 2017 the number one cryptocurrency has seen its value quadruple. Then its market value was worth just $16.5 billion. While that was still an impressive figure, it’s not anywhere near what it has achieved to date. According to a report, if bitcoin was a stock it would rank as the seventy-fourth biggest by market capitalisation. This would put it in league with Adobe and Netflix on the S&P 500. Adobe has a market value of $73.6 billion while Netflix is worth $73.8 billion. It has already passed the likes of PayPal, Costco and Salesforce. Furthermore, by 2030, research by U.K.-based Magister Advisors suggests that bitcoin will become the sixth largest global reserve currency. After interviewing thirty leading bitcoin companies they believe it could be as widely used as the Swiss franc or the Australian dollar. It’s now getting harder for investors to ignore digital currencies. That’s according to Goldman Sachs. Nearly two weeks later and the market cap value is worth $144.6 billion. Naturally, with the digital currency continuing to dominate the market, investor interest is increasing. Not only that, but many are turning to bitcoin as a safe haven amid geopolitical turmoil. In light of North Korea’s nuclear threat there has been a global selloff in stocks and bonds. Furthermore, Fidelity Investments announced that they would be allowing clients to see their bitcoin and ethereum holdings on Coinbase. This is a rare example of an established financial services company being embracive toward digital currencies. Abigail Johnson, Fidelity’s CEO, has, in the past, spoken about her enthusiasm over the digital currency market. With the current trajectory that bitcoin is on, one has to wonder how far it can go? Ronnie Moas, Standpoint Research founder, recently made a revised projection that the digital currency could reach $7,500. In July he stated that it would scale to $5,000 predicting this would be achieved by 2018. In light of bitcoin’s recent movements $7,500 is his new estimate. He also thinks that the value of bitcoin will climb to $50,000 by 2027. Compared to others, though, Moas’ estimations are quite conservative, which he admits to. Unlike Moas, Dennis Porto, a bitcoin investor and Harvard academic, he predicts that bitcoin’s value will jump to $100,000 by February 2021. He thinks this is possible if the currency follows Moore’s law. According to Porto, since bitcoin was introduced in 2009 it has double every eight months. Therefore, until it reaches mass adoption, he thinks bitcoin could reach $100,000 by 2021. Kay Van Petersen, a Saxo Bank analyst has also predicted a $100,000 future for the digital currency. However, he thinks this will happen in 10 years time. In a report, Van Petersen said that while his estimations are ‘conservative’ he believes in where the market is going. Interestingly, this is the same analyst who rightly predicted that bitcoin would reach the $2,000 mark by 2017. All that remains is to wait and see what will happen next. Will bitcoin’s price go up or will it go down? Who knows, but a period of adjustment is to be expected. With such massive gains the digital currency will undergo a price correction. According to Sheba Jafari, Goldman Sachs’ chart analyst, the cryptocurrency is currently in the ‘fifth wave’ of an ‘impulsive’ rally. She thinks, in the short-term, its price will rise to $4,827 before entering a corrective phase. As such the digital currency could drop as low as $2,221 in Jafari’s opinion. For now, though, many are enjoying the advancements that the currency is making. The price of bitcoin soared above $4,400 and was within striking distance of $4,500 for the first time. In the early hours of the 15th August, the digital currency recorded a new all-time high of $4,482, according to CoinDesk’s Bitcoin Price Index (BPI). As can be seen from the chart above, throughout the day bitcoin’s price has continued to fluctuate. At the time of publishing, bitcoin is trading at just above $4,000 at $4,018, according to figures from CoinMarketCap. As a result, it has seen a -6.03 drop in value within the past 24 hours, but a 17.69 percent increase over the past seven days. This slight dip in price comes after days of record highs, which has seen the currency’s market value soar to over $72 billion. At present, it’s worth $66.3 billion. The drop in price could be due to investors taking some profit after the rapid rise, which is to be expected. Since the beginning of the year, though, the price of the digital currency has quadrupled in value. This has been spurred on by strong interest from the Japanese as well as geopolitical turmoil in North Korea. Despite a drop in value, Ronnie Moas, stock research analyst and founder of Standpoint Research, said that bitcoin could reach $7,500. This price is a revision from his early $5,000 price projection for 2018. When bitcoin’s market cap reached $72 billion it was reported to be within striking distance of major stocks like Netflix. According to a report from CNBC, if the cryptocurrency was a stock it would rank as the seventy-fourth biggest by market capitalisation. Such a position would put it behind Adobe and Netflix on the S&P 500. Adobe has a market value of $73.6 billion while Netflix is worth $73.8 billion. At present, bitcoin’s market value has already overtaken Paypal, Costco and Salesforce. Bitcoin isn’t a stock, though, as many investors view it as a currency or commodity. However, due to its finite supply of coins, capped at 21 million, Moas is one individual who believes this could push bitcoin’s price up. Other analysts are being more bearish. Sheba Jafari, Goldman Sachs’ chart analyst, said that the digital currency is riding a ‘fifth wave’ of an ‘impulsive’ rally. As such, Jafari thinks bitcoin’s price will rise to $4,827 in the short term. Jefari said that this could see the digital currency drop to as low of $2,221. If such a situation proves itself true, it won’t be the first time that the market has experienced a price correction. When bitcoin sailed through the $3,000 barrier in mid-June it subsequently lost over $1,000 in value. On the 15th June, the digital currency was trading at $2,330, pushing its market cap down to $40 billion. It’s natural that the market will experience a slight drop in price after its rapid rise. Many think, though, that in the long-term its price will increase into the hundreds of thousands. Dennis Porto, a bitcoin investor and Harvard academic, is one individual who has projected a high price. So much so, that he believes bitcoin will reach $100,000 by February 2021. He claims this is possible if it follows Moore’s law. Kay Van Petersen, a Saxo Bank analyst, has predicted that the digital currency’s price will reach $100,000 in 10 years. This is the same analyst who rightly predicted that bitcoin would reach the $2,000 mark in 2017. Not as bullish is Tom Lee, a strategist at Wall Street firm Fundstrat. He thinks that by 2020, the digital currency will be worth between $20,000 and $55,000. At the time of publishing the entire market cap value is worth $133.3 billion. It’s not just bitcoin that has seen a drop in value. 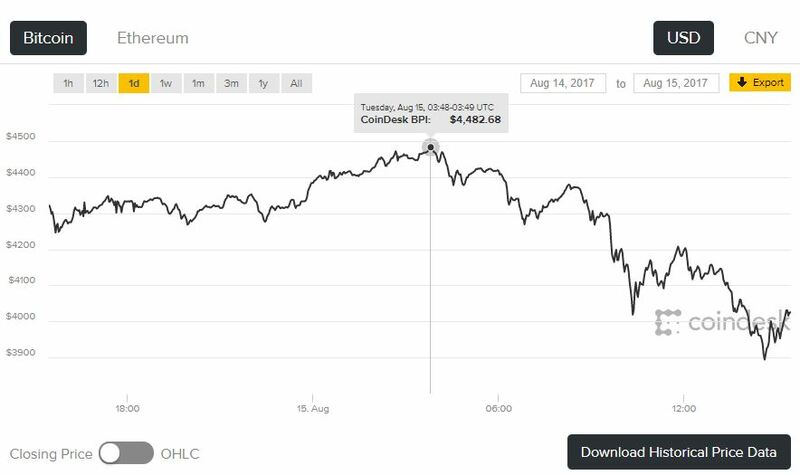 Ethereum’s price has dropped too. At present, it’s worth $285 and has seen a -4.19 percent drop in 24 hours. Over the last seven days, its value has decreased by -0.38 percent. Its market value is now worth $26.8 billion. Third place ripple has dropped in price as well. It’s now trading at $0.160454 and has a market cap of $6.1 billion. In 24 hours its value has decreased by -5.27 percent and in seven days it has dropped by -12.38 percent. Bitcoin cash, in fourth place, has experienced a slight drop too. At present, it’s trading at $295 with a market cap of $4.8 billion. Over 24 hours it has dropped by -1.05 percent and in seven days a decline of -15.31 has been reported. Despite these price declines, eight place NEO is steaming ahead. Its market cap is currently worth just over $2 billion and is trading at $41.86. Even though it has dropped by -9.81 percent in 24 hours over seven days it has increased its value by an impressive 142.25 percent. It remains to be seen how far this altcoin can go. Furthermore, the community will be watching and waiting to see how much further the price of bitcoin will drop or if another surge in its price will be recorded. For now, many traders are enjoying this price rise which is producing big profits for many.